Jason Walked has often wished his life could be a bit less predictable -until a routine day at the zoo ends with Jason transporting from the hippo tank into a strange imperiled world. In this search for a way home, Jason meet sRachel, who was also mysteriously drawn to Lyrian from our world. Jason and Rachel become entangled in a quest to piece together the Word of Power that can destroy the emperor, and learn that their best hope of finding a way home will be to save this world without heroes. To recover the Key Word. Marks you for prompt execution. I’m used to reading a lot of fantasy novels, but I believe this tops them all as the most inventive. Mull creates a very interesting world full of suspicion and intrigue along with interesting and unique characters. The creatures that he wrote of went from huge dining-table-sized crabs to displacers —humans who can cut a limb off while still having full function of said limb. Out of the whole story, I found the unique creatures the most interesting. They were very inventive and gave the story an odd suspicious aura that I found intriguing and alluring. 2. Such fun and witty characters. However, I also found that the book, while it abounded in characters -both human and fantasy -he did not develop those characters as much as they could have been. Due, to Jason’s quest to find the six syllables of the Word, it’s natural that he would discover friends along the way; however, I feel as though each secondary character should find more of a purpose throughout the rest of the novel. That being said, I give this book a break on that end because it is only the first book in a whole series. So Mull has plenty of time to bring back the characters he began developing in this novel. I will say that I look forward to seeing more of Ferrin -he was my favorite character out of all of them. I think that’s partially because I felt that he was a little more dynamic, and I also hope to see more of Ned. He was only in a single chapter, but he made that chapter seem more thrilling for some reason. I will say that the dialogue was priceless! The characters were quite witty and engaging and extremely endearing. I rooted for them without reservation. Yet, it also made me question how in the world could kids so young (6th grade, I believe) have the wittiness and intellect of an adult. There was nothing about them that screamed pre-teen or young teenager. There were times I even pictured them more as adults. I don’t quite know if this is a bad thing or a good thing. There is also a part in the novel that defines heroism. This truly stuck with me. I believe that children/teenagers have to realize what true heroism is and this is a great book to teach them. You really can’t go wrong with this book. It has lovable character albeit a little less dynamic than I would have hoped, and the plot! Oh, the plot is wonderful! I love the quest that the main characters, Jason and Rachel, embark on. It creates a constant thrill for the reader and there is hardly any downtime. 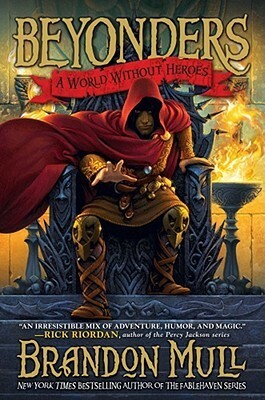 After reading this book, I am also interested in reading his Fablehaven series. So if this sounds like something you would like to read but don’t want to wait for the rest of the series to come out, try Fablehaven. I gave this book 3.75 stars on my Goodreads.